Your dream Koala sofa has arrived and you have the perfect coffee table to match. Now what do you put on it? Yes you want it to look pretty, but I’m also a big believer in functionality going hand in hand with style. Here are my tips for styling your coffee table like a pro and getting the balance between style and function. Choosing pieces for your coffee table is a great way to display your style and personality. Don’t be shy about adding quirky or meaningful pieces! They can be a great conversation starter as well as a reflection of what currently interests you. A shell from your recent beach holiday or a beautiful handmade dish from a market in Marrakesh. You can’t go wrong if they mean something to you. 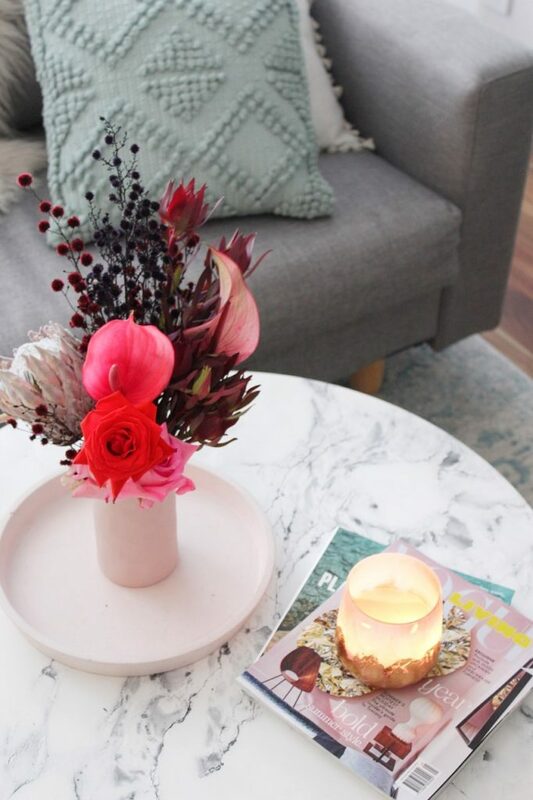 One of the simplest ways to add interest to your coffee table is with flowers. It’s important to choose your vase first before deciding on the perfect bunch. The importance of scale and functionality is the key to your success when selecting the correct vase. Binge watching your fave show with a big bunch of blooms in your eyeline is not recommended. A short vase with a tightly arranged bunch of flowers is the way to go. Peonies, roses, natives or even sprigs of lavender from your garden are a perfect touch. 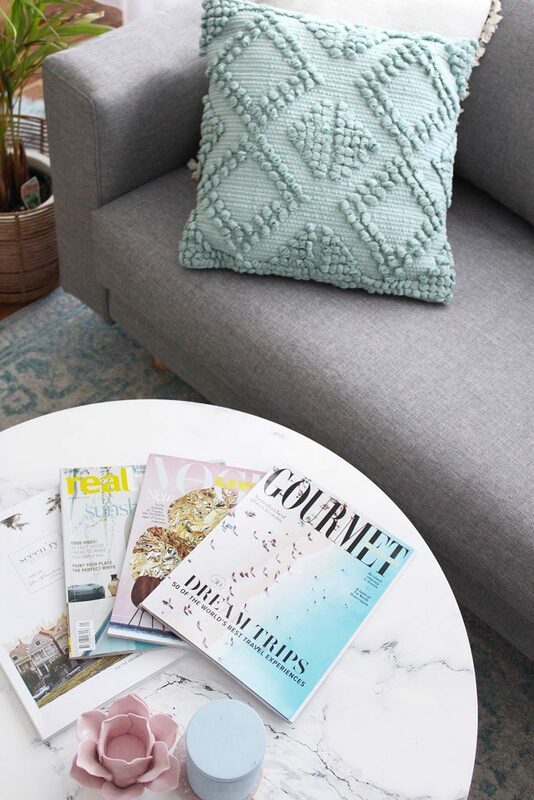 One of my all time favourite pieces I use to style my coffee table with are magazines! If like me, you have a pile of old magazines clogging up your bedside table, then dust of your faves and get stacking. A short stack of magazines or even a carefully curated selection lined up can create a great impact and also add pops of colour. Choose magazines that have complimenting colours to your artwork or cushions for a cohesive look. Or for a real POP add a bold magazine to really draw the eye. 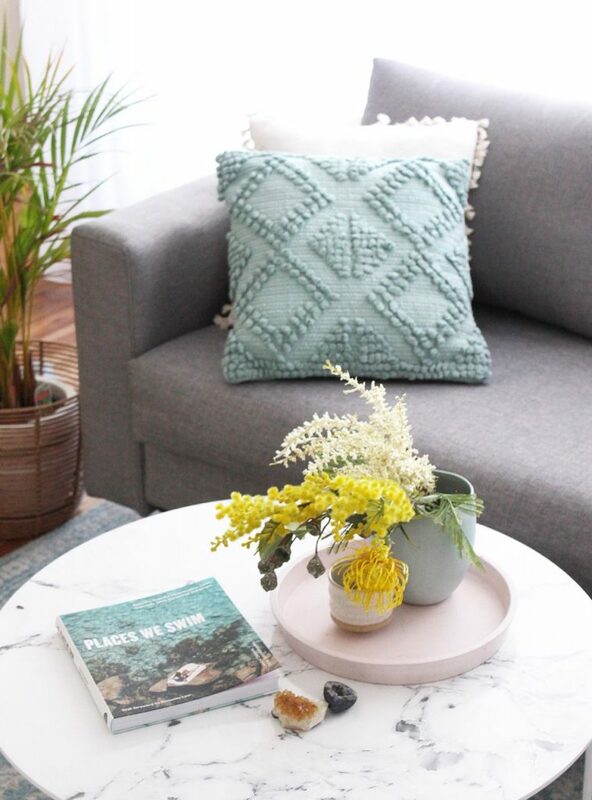 As the temperature heats up and summer vibes are in the air, change up your coffee table pieces with books or magazines reflecting the warmer weather. Add summer scented candles and a photo album of your favorite summer holiday to help inspire you to plan your next getaway. In the cooler months add a few tea light holders in warm glowy hues. Aromatic candles with hints of cinnamon also help to create a feeling of warmth. Start your 120 night with the Koala Sofa by clicking here!